The Board of SIC Insurance has been re-constituted with the Ministry of Finance replacing government’s representation on the Board. The members representing the Government of Ghana through the Ministry of Finance are Dr. Jimmy Heymann, Mrs. Pamela Djamson-Tettey, and Mr. Stephen Oduro. Mr. Michael Addo replaced the Social Security and National Insurance Trust representative who has retired from the company whilst Mr. James Appietu-Ankrah joins the Board as an independent member. 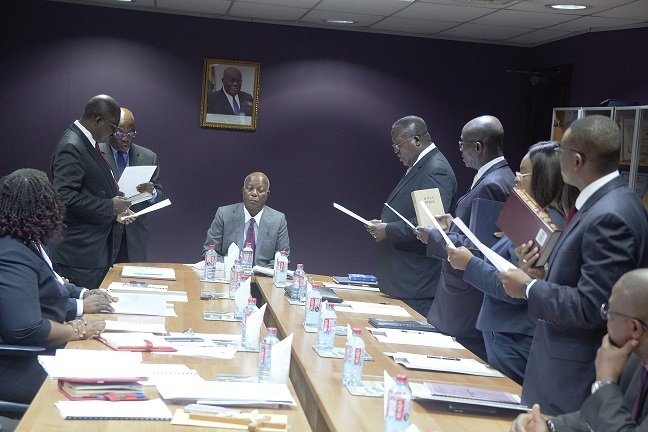 The new Board was inaugurated by Justice Benjamin Okai Tetteh, a retired High Court Judge and Dr. Jimmy Heymann was appointed to Chair the Board. Subsequently, Mr. Stephen Oduro was appointed by the Board as the Managing Director of the company. Stephen Oduro has over thirty (30) years of progressive experience in leading financial application systems development projects, designing, installing, and implementing for banking, insurance, brokerage and healthcare industries. He has proven skills in analysis, research, communication, designing of quality assurance strategies, and negotiation. Stephen is detailed and result-oriented with the ability to handle multiple projects simultaneously. Until his appointment, he was an Associate/Senior Change Management Specialist at Brown Brothers Harriman Inc, Jersey City- USa, responsible for implementing Change Management tools for the Quality Management department. From 1997 – 2000 he was a Partner/Senior Consultant at Afrisys/Constech Consulting Services, Accra, Ghana where he carried out a number of Consulting services for the government of Ghana to manage Y2K conversion and designed Network topology for the Executive Office of the government of Ghana. He also has several years’ experience working on various projects and in various capacities at Prudential Insurance Company, Roseland, New Jersey. He is a product of Rutgers University, Graduate School of Management, Newark, NJ with an MBA in Computer and Information Systems with Financial Application bias and the Bernard M. Baruch College, City University of New York, New York City, NY with a B.B.A., Computer Systems. The Board Chairman, Dr. Jimmy Heymann, pledged to uphold and develop corporate policies and strategies for building and sustaining an endurable institution that guarantees professionalism and profitability whilst enhancing shareholders’ value.